Are Modern Concert Halls Forbidding? Do Visuals Help Classical Music? Getting a start as a classical composer has never been easy. Historically, composers have had to cozy up to a wealthy patron or find a champion in a powerful orchestra maestro who could put their music in front of a ticket-buying public. In the 21st century, orchestra budgets often don’t have the financial wiggle room for as many commissions and competition is fierce for new music being submitted to classical music festivals. However, some young composers are looking at crowd funding like Kickstarter as a way to bypass traditional avenues and find their audience and funding one fan and a few dollars at a time. 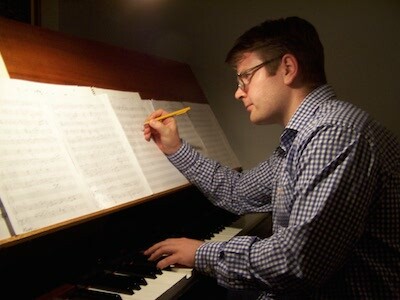 New York City-based composer Chris Whittaker studied composition at the Peabody Institute before getting a master’s in orchestral conducting at the University of Michigan. shared sentiment among his peers that if they were going to make a living in music, they couldn’t expect it to come easily or rely on traditional music institutions. Without that tap on the shoulder, young composers have to be both artist and entrepreneur. In the case of getting their music recorded, the tasks of financing, hiring freelance musicians, arranging with a recording engineer and sorting out a venue become part of a composer’s job description. Whittaker wrote a chamber symphony while in Michigan that he was looking to record and distribute to classical music fans. He submitted the piece to new music festivals, but Whittaker said he didn’t want to wait around just hoping for those leads to come through. In late September, Whittaker launched a campaign on Kickstarter to raise a few thousand dollars to record two movements of his symphony with 38 musicians. “I had an idea that my family, friends and some people I knew would give to the project, [but] we've had folks from all over the world chip in a couple of bucks,” he said. “Every day I'll get an email that someone has chipped in $5 or $10 [or even a dollar] to just get a digital download of the piece. Whittaker said he was overwhelmed by the support and interest in the project. The Kickstarter campaign passed its initial goal and money received beyond that will go to cover recording expenses and pay the musicians recording the piece a little extra. Whittaker’s work will be recorded in late October when the campaign ends. Unsigned indie rock bands were among the first musicians to look to crowd funding campaigns to raise money with the help of devoted fans to record a new album. But recently, more and more classical ensembles and composers are popping up with an idea for a CD or project they want to fund and release through fan support. “I don't know if the crowd source model is always the right thing at the right time for everybody, but at this point in my life it's allowing me to get out there a little more,” Whittaker said.